is the editor of the Royal Institute of Philosophy journal THINK. He researches primarily in the philosophy of religion. His books include The Philosophy Gym: 25 Short Adventures in Thinking (2003) and A Very Short Introduction to Humanism (2011). He lives in Oxford. 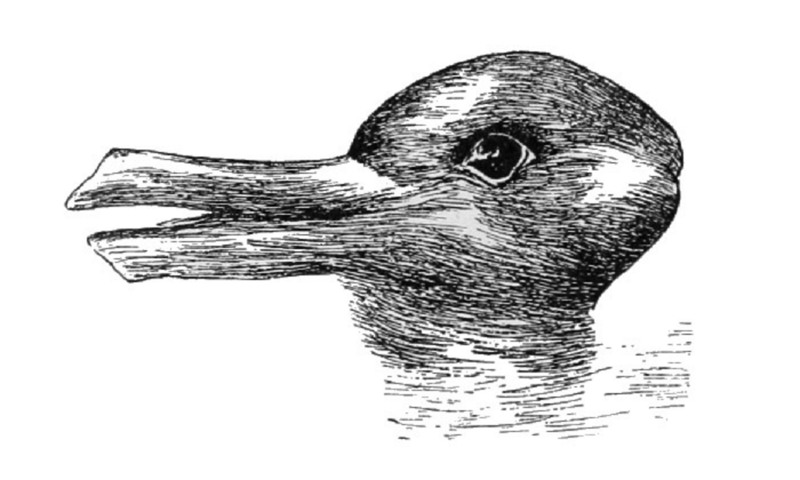 The duck-rabbit image above is one of the most iconic in philosophy – so iconic that a former undergraduate of mine had it tattooed on his leg. So what’s philosophically significant about this dot and wavy line? Wittgenstein provides many other examples of this kind of ‘change of aspect’. For example, you can see the four dots below as either two groups of two dots, or as one group of two dots flanked by a dot on either side. 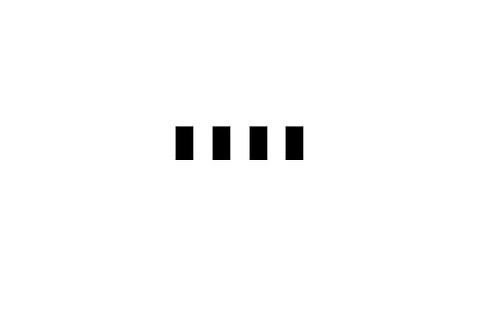 Try switching between seeing the dots in each of these two ways. What’s philosophically significant about this sort of experience? One interesting question such images raise is: what happens when the aspect changes? What happens when we shift from seeing a box orientated one way to a box orientated another? Clearly, it’s neither the image on the page, nor indeed on the back of your retina, that changes. The change, it appears, is in you. What sort of change is that? One way in which we might be tempted to explain this change is in terms of a change to a private, internal image. Yes, the image on the page remains unchanged; it’s your internal image – the one before your mind’s eye, as it were – that has changed. But Wittgenstein rejects this explanation. I might use the Necker cube image above to capture exactly how the cube looks to me when I see it one way, but also exactly how it looks when I see it the other way. In that case, it seems as if my visual impression – and thus my ‘private’ inner image, if I have one – must be the same in each case. But then it can’t be a change in any image – be it on the page or on my private, inner stage – that explains the change of aspect. the striking case of the change of aspects merely dramatises for us a feature (namely seeing as) which is present in perception in general. For example, when I see a pair of scissors, I don’t see them as a mere physical thing – I immediately grasp that this is a tool with which I can do various things. Seeing the object as a pair of scissors is something I do unthinkingly and indeed involuntarily. On the other hand, someone entirely unfamiliar with the concept of a pair of scissors not only won’t but can’t see the object that way. They might see a pair of scissors lying on the table, of course – but they cannot see them as a pair of scissors. ‘Seeing as’ is concept-dependent. You are ‘seeing as’ right now. You are looking at these squiggles on a white background and seeing them as letters, words and sentences, and indeed as meaning something. This is the unthinking response of someone who understands written English – you don’t have to infer what’s meant by these lines (as you might if you were a non-English speaker using a phrase book, say). What I mean is immediately, transparently available to you. And we don’t just ‘see as’, we ‘hear as’. What goes for written English goes for spoken English, too. When I hear another person speak English, I don’t hear mere noises I must then decode – I hear those noises as meaning (eg, shut the door!). One particularly interesting example of a change of aspect perception involves our ability to suddenly ‘get’ a tune or a rule, so we are then able to carry on ourselves. Suppose that, in a game of Name That Tune, I hear a series of musical notes. Suddenly, I hear them as the opening bars of ‘Ode to Joy’, say, which I can then carry on confidently whistling myself. This too, seems to be an example of a change of aspect. I switch from hearing the notes as mere notes to hearing them as the opening bars of a melody – a melody I can then continue myself. Or consider the moment that we suddenly grasp an arithmetical rule. Suppose someone starts to explain a rule by gradually revealing a series of numbers – first 2, then 4, then 6, then 8. I might suddenly ‘get’ the rule they’re explaining (call it ‘Add 2’), so that I can then confidently continue myself: ‘10, 12, 14’. What happens when I have that flash of insight? The numbers before me haven’t changed, and yet suddenly I see them differently: as a segment of an infinite series – a series I can now continue myself. Wittgenstein was particularly interested in what happens when we suddenly grasp a rule in this way – when we ‘flip’ from seeing just a series of numbers to seeing them as the manifestation of a rule that extends over the horizon. In short, ‘seeing as’ is a philosophically rich topic that connects with – and can help to shed light on – many central questions in philosophy: questions about the nature of perception, about what it is to grasp meaning, and about rule-following. However, the notion of ‘seeing as’ also provides a more general thinking tool with potentially all sorts of applications. Consider, for example the question of what makes an ordinary object – Marcel Duchamp’s upturned urinal or Tracey Emin’s unmade bed – a work of art? Is what makes such an object an artwork the fact that we see it as such? The idea of ‘seeing as’ also crops up in religious thinking. Some religious folk suggest that belief in God doesn’t consist in signing up to a certain hypothesis, but rather in a way of seeing things. What distinguishes the atheist from the believer, it’s argued, is not necessarily the ability to recognise the cogency of certain arguments for the conclusion that God exists. Rather, what the atheist misses out on is the ability to see the world as God’s handiwork, to see the Bible as the word of God, and so on. Just as some suffer from a kind of aesthetic blindness – they can’t see a particular painting by Pablo Picasso as a powerful expression of suffering – so, some suggest, atheists suffer from a kind of religious blindness that means they’re unable to see the world as it really is: as a manifestation of the divine. This last example brings me to a word of warning, however. Seeing something as a so-and-so doesn’t guarantee that it is a so-and-so. I might see a pile of clothes in the shadows at the end of my bed as a monster. But of course, if I believe it’s a monster, then I’m very much mistaken. And I can be shown to be mistaken.